The Millwall game and how we snatched victory from the jaws of defeat got me thinking. Occurrences like this have happened before but OMG not really that often. It’s time for a few of my personal memories to come to the fore during the international break, I guess. I’ll start with that header from Steve Bruce against the Binners in that semi-final. Yes, I was there. And from the second the ball deliciously hit the net I remember nothing more of what little was left of that game. I was trampled and probably did a bit of trampling myself. Maybe footy life gets better than that, but I don’t really think so. Loads of folks have been commenting recently about Simeon Jackson’s bundle in against a Derby County side who had to do without Frank Lampard in 2011. Again I was there and the whole ground went ape. Us lot in the Barclay went double ape$hit and I mean it. I honestly thought the Upper was going to collapse and descend into the Lower. Luckily for all concerned it didn’t. But what I remember more about Simeon Jackson came from a game I did not attend. 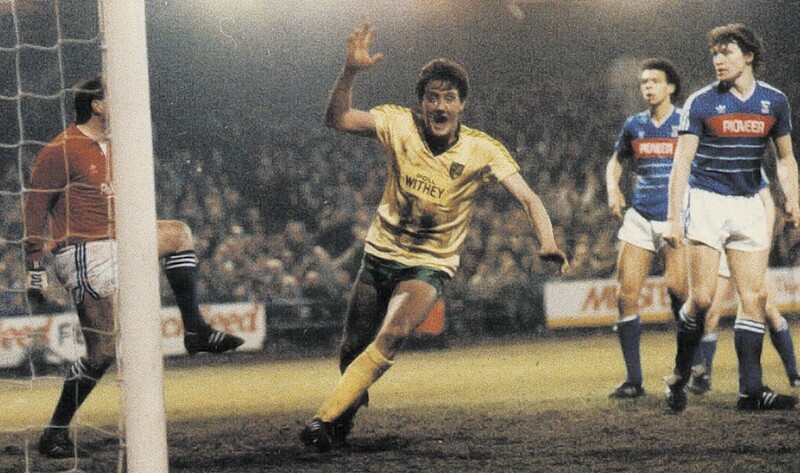 Andy, John and myself watched Portsmouth v Norwich in the Railway Tavern in Coltishall (sadly now private dwellings) along with around 100 other folks.When David Fox crossed from the right and Jacko stooped to nod it home I think the pub went treble ape$hit – if that is indeed possible. Andy, John and myself were bouncing around singing campiones, campiones, ole ole ole. Andy is fluent in Portuguese and I speak a bit of Spanish, so we just about got away with it. No-one would have given a stuff anyway. Guv’nor Dave (a Liverpool fan) put a couple of bottles of Shampoo on the bar. I had a quick swig of it from my previously empty pint glass and disappeared into the night. When I phoned Mrs P shortly afterwards, she thought it was a nuisance call from somebody else as I was so ecstatically happy. Not a common trait of mine as she well knows. Then there was Justin Fashanu’s stunner against Liverpool in a game we lost 3-5. I wasn’t there for that one because I was stuck in London. And there was also Robert Rosario’s rocket against who knows who, but I didn’t personally see that either for exactly the same reason. I did see Gossy’s volley in Munchen because I was there. There’s a poster out there somewhere on other sites who goes under the name of Goss Volley. Fair play to him. People tend to forget how good Mark Bowen’s goal in the same game was. But it was totally eclipsed by Gossy. This all brings me back to my starting point. Possibly, no, definitely, my favourite was Robert Fleck away to Millwall (them again) when both clubs were in the top half of the table in what was then Division One. Late 1980s for sure but don’t ask me to pick a precise year. We went 2-0 up and got hammered back to 2-2. Then in the dying embers of the game Flecky hit probably the most divine volley I have ever seen. Live on TV and most of the country was talking about us thereafter. Like I hope they are now. Cos we ain’t bad, now are we? Probably my lasting memory of that day in 2011 was seeing Colin’s face when the news filtered through to Loftus Road and you didn’t need to be much of a lip reader to know what he said!!! Honourable mention MUST also go to ‘Neeyull’ for his reaction alongside Chris Goreham in the commentary box. I had even more good news that day, as I’d put £2 on Jacko to score first, but even better than that, I bet £5 on the actual score and split it over various scores and yes, one of them was 3-2 at 25/1. and I’d bet £1 on that being the final score. A VERY memorable day for all the right reasons and I’ve said many times that I haven’t witnessed the unity between the manager (Head Coach)/team/fans since that season. The $64,000 question – can we achieve the ‘P’ word??? I’m hoping we can, but in the meantime, I’m LOVING going to CR on match days and being ENTERTAINED!!! I reckon you saved the best of a fine comment until last. I’m loving going to CR on match days and being entertained too! Maybe I favoured Jacko’s goal against Portsmouth over his Derby one simply because I was in my local pub with my mates and we knew just about everybody who was in there. And it’s far easier to go ape when their aren’t any fixed position seats six or whatever inches in front of you. Chris Goreham is a proper fan, nice bloke and a great commentator. NA was probably his best sideman, although I do like Rivo and Mark Walton is excellent too on his rare appearances. Great comment and thank you. 1973, fifteen year old yours truly stood in the old south stand with 38 thousand other folk and watched Dave Stringer head home a late winner to secure 1st division status. I was one happy bunny that night. That’s the stuff of legend to me Andy! I’m exactly the same age as you by the sound of it but as my folks lived in London I very rarely got to see us in the 1970s. I didn’t get to live here permanently until 1988. That situation was offset by easy train/tube journeys from Chadwell Heath (73) Theydon Bois (75) and Buckhurst Hill (85) for the League/Milk Cup finals! Dave Stringer I remember more as a manager than a player and he did a fine job in both capacities. I total agree with you about the time-wasters, especially those who don’t even try to be subtle about it. The recollection of Robbie Savage taking one step forward and two steps back to get off the pitch still haunts me to this day. Never was justice better served than by Jacko’s late winner. PS – If my memory serves me right, the game against Derby game was 4 days after a MEMORABLE night in NR1. I well remember arriving in Riverside on a glorious sunny afternoon on Maundy Thursday and outside a certain pub was a ‘sea of yellow’, some 3 hours before the start of the ‘beam back’ from Portman Road. I was still in the pub when the trains carrying the Canaries’ fans arrived back and lots of them headed straight for the pub. WONDERFUL. That’s a spooky one Ed! We were waiting to meet our neighbour Carlos for a lift home at a bar in Palma one Sunday with me having my Real Mallorca shirt on (it was live on the TV) when the “afficionados” returned from the mainland en masse with Real having just won the Copa del Rey. And us Brits think we can drink… wonderful was indeed the word. I saw Real several times but never against Barca – you couldn’t get a casual ticket for love nor money. They’re virtually bust now and in the third tier – sad. Another which stands out for me was being soaked on the open terrace at Vicarage Road when we won promotion to the old first division. I think Stringer was the scorer again, and although not a late winner meant that we got promoted. The rain was incessant, the open terraces full with NCFC fans, and the covered stand at the opposite end sparsely populated with home fans. So, a takeover was necessary in order to keep dry, and completed without any fuss! Happy days, although I do think the football we’re now watching is rather better! I had no means of getting to Vicarage Road that day as I didn’t pass my driving test until 1974, one week after my 17th birthday. But I would have gone if I could and I do vaguely remember it. I’m sure Radio Five wasn’t around way back then and I think I heard the final score on Grandstand. With David Coleman? I must admit and with a deep sense of regret that the entire 1970s was a blank NCFC canvas to me apart from those losing League Cup finals. They were happy times indeed although most of mine were spent at White Hart Lane back in the day. Looking back that era was so carefree as I was young and single with only my job and my p**** to keep. Plus stuff on the TV that wasn’t PC. The major drawback was the sound of rumbling boots and other neo-fascist antics of course. Never took part in an “ingression” myself – whatever the weather. Thanks – a lovely post. Me too, John! It was indeed Dave Stringer who scored in front of us (fittingly – Duncan Forbes always caught the eye, but Stringer was as consistently effective as any City player I can remember), and it ensured the 1-1 we needed. I’m sure there were many chants that day from the City fans, but “We took the Rookery” sticks in my mind. Best of all, Big Dunc in the last minute of the last game of the season home to West Brom. FOR A 1 1 draw. Hi Patrick – great comment. I do remember Roger Gibbins for what it’s worth. I doubt I saw him play more than twice. Which is exactly the same amount of times I saw Duncan Forbes play, Unfortunately. I also remember some largely unsung heroes such as Kevin Drinkell, Ted MacDougall and Phil Boyer. Plus Dave Williams in midfield as well as previously Graham Paddon, Spearo and Trevor “Werewolf” Hockey who did their stuff. Admirably. However to come back to your Roger connection, Careless Hansbury in goal did nothing for me. Or most of us in the Barclay! Gunns senior and junior, KK and Fraser Forster were my favourites. And I guess will remain so. The only other two I can think of off the top of my head were loans. One great (Neal Fenn) and the other last season who never even got on the pitch – Marcus somebody. Maybe Edwards? Had a few good night in the pubs in and around Coltishall in 1970 while stationed at the RAF camp but then had many good nights in many a pub over the years while watching football. Late winning goals are always exciting when its your team score them and had a few that have been mentioned above but the worst feeling is out playing the opposition and they score the ladt minute winner those seem to drop from your memory and city have had there share of those over the years. Good news on Sky is that Hanley has signed an extension to his contract and one German coach out while another arrives so I will say thankyou to the one leaving for all the goid work he has done and wish the new man a hearty norfolk welcome and hope he keeps up the goid work. One of the favourites for the RAF lads used to be the Skeyton Goat. and the Red Lion was popular too, especially with officers. Of course the Rising Sun is always the one mentioned in connection with WWII. There are bound to be calls for Darren Huckerby to replace Matt Gill simply because his popularity endures for all of us. Like you I cannot see it happening. Surprised nobody’s mentioned Martin Olsson’s late one v Newcastle a couple of years back. Worth the long round-trip, that one was. But then I have form for watching Newcastle get beaten, having been at Edgar St all those years ago for the Ronnie Radford game…. That match captured the imagination of lots of us. I remember the Hereford pitch was like a quagmire that day. For some strange reason their game against West Ham – as I recall through the mists of time) was played on a Wednesday afternoon. I got home from school in time to hear the last half hour on the radio. When it comes to goals against Newcastle nothing tops Youssef Safri for me! The first game was a midweek evening; Billy Meadows crashed one against the bar and Ron Greenwood (or maybe Bobby Moore) admitted they were lucky to survive 0-0. It was the replay that was in the afternoon. Wasn’t it because of power cuts and the like during a miners strike? I was listening to it surreptitiously at the back of a History A level class. I still look out for what’s happening down there though it’s probably 35 years since I saw them play. Yes you’re quite right it WAS the replay. The famous miners’ strike was 10 years later I believe.. But every $od was on strike at that time – dustbinmen, grave diggers, Bus and Underground drivers, the lot. The only people who weren’t were the Police (including my Dad) and the Nurses. Although given the choice I think they would have been. Awful times to be an adult but great times to be a kid. Martin I read to very interesting articles today interviews with Zoe Ward as with many people I didn’t realise she was at city prior to her husband being recruited and was instrumental in signing Maddison also the smiths got her opinion on recruiting said husband and was first port of contact. I feel the timing was kind of strange given the Southampton rumours but establishing her credibility as so much more than “Mrs Webber” did the Club no harm at all. I knew that the mechanics of transfers were part of her remit but I had no idea she got Madders here at the very last minute! As you it was ir us a strange time for 2 interviews from Webber’s wife or is that me being sinical. Another Spur, at the same time as Crook, Bowen and Cully, was Gary Brooke, then there was someone called Keane of course.